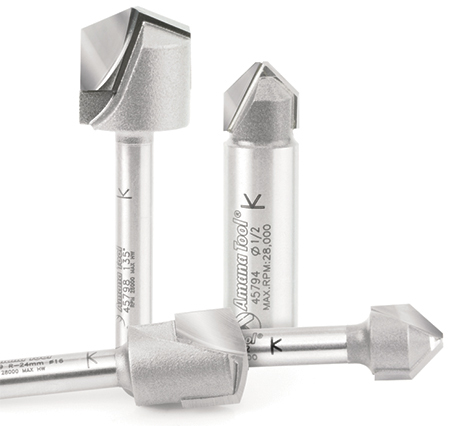 Amana Tool, Farmingdale, NY, a manufacturer of industrial-quality carbide-tipped, solid carbide and replacement carbide cutting tools, has developed double-edge folding V and rectangular-groove router bits. The panel-shaping collection features four profiles specially designed to cut aluminum/plastic sandwich materials such as Alucobond and Dibond. The double-edged folding V and rectangular-groove router bits find use in sign-making applications and to create cladding for office buildings, hospitals, airports and hotels, among other locations. The design enables removing the aluminum cover and part of the polyethylene core to allow folding the material while maintaining its structural integrity. The router bits include 90-, 108- and 135-deg. profiles, as well as a rectangular-profile bit for creating folds in thicker walls. Each bit is manufactured from Amana’s exclusive-grade carbide.